FireWire, i.LINK or 1394 is a bus for serial data transmission. 1394 named by the Institute of Electrical and Electronics Engineers and since 1995 the specification is a standard. FireWire is the appropriate trademark of Apple, whose development began in 1986. i.LINK is a trademark of additional Sony. IEEE 1394 is the High-Definition Audio-Video Network Alliance (HANA) standard connection interface for A/V (audio/visual) component communication and control. FireWire is also available in wireless, fiber optic, and coaxial versions using the isochronous protocols. Rights and fundamental patents forgives MPEG Licensing. The merge was in 1999 by Apple, Compaq, Panasonic, Philips, Sony, STMicroelectronics and Toshiba. Not until the late 1990s, Apple Macintosh and a few other computers came with FireWire, as Apple charged $1 license fee per connection. Previously, producers received a blanket license for $7500. Full penetration FireWire had at that time already in DV camcorders and was followed by a declaration of war by the incipient development of the Universal Serial Bus. In spring 2004, the specification for wireless FireWire was adopted. A maximum number of 63 devices are per bus are possible to add with FireWire. FireWire IEEE 1394b supports ring topology. Up to 1023 buses can be connected by bridges, so that total 64,449 devices can be connected. The maximum length of a S400-connection between two devices is 4.5 meters. In the use of S200, the maximum distance is increased to 14 meters. With FireWire IEEE 1394b, other types of connection network cable, plastic and fiberglass have been defined that allow a cable length between devices up to 72 meters. 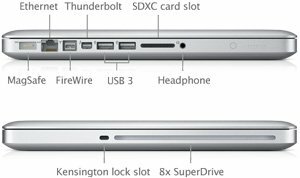 Unlike the Universal Serial Bus (USB), FireWire allowed direct communication of all the devices with each other ( peer-to-peer ) without a host. The exact data rate for the basic version (S100) is 98,304,000 bits per second (bit /s) or 11.72 MB/s. FireWire is mainly used in video technology, but also used for connecting external storage as DVD burners, hard drives or for connecting consumer electronics components. Also a lot of audio interfaces for usde in music production are offered with the FireWire port. To use the data transfer rate of modern hard drives in external enclosures, the use of the new nine-pin FireWire 800 (1394b) is necessary because the conventional FireWire provides a nominal speed. A faster alternative to FireWire 800 is external SATA enclosures without a bridge chip which can directly access the hardware. The power from FireWire is specified at 1.5 amps at 8 to 33 volts. External hard drives can therefore be easily operated without a separate power supply unit to a six-or nine-pin FireWire port. As in the automotive connectors must meet specific requirements, the IDB Forum special connectors have been defined. The IDB-1394 connector is based on the nine-pin IEEE 1394b, but extends it to a locking cable lock. The OHCI specification ( Open Host Controller Interface ) includes a mode for FireWire controller, FireWire devices in the main memory may be read by a computer or write. This mode is configured by a driver, read and write requests are autonomously executed by the hardware, without having to involve software on this computer. This allows extensive control of the computer by the other FireWire bus connected node. At least in the default configuration, among others are Windows , FreeBSD , Mac OS and Linux vulnerable. This Article Has Been Shared 167 Times! Cite this article as: Abhishek Ghosh, "FireWire : The IEEE 1394 High Speed Serial Bus," in The Customize Windows, February 27, 2013, April 26, 2019, https://thecustomizewindows.com/2013/02/firewire-the-ieee-1394-high-speed-serial-bus/.